Thai Yoga Massage is a therapeutic treatment, which the client receives in comfortable clothing on a mat on the floor. In the process, the energy line system of the 10 Sen, through which the natural life energy flows, is supported. Through the so called palming and pressing along these energy lines as well as passive stretching, the fascia tissue is stimulated and accumulations or knots are loosened. Blockages, physical and emotional imbalance, ailment as well as pain, are being removed through this support, the balance is re-established and the potential of self healing power is released. 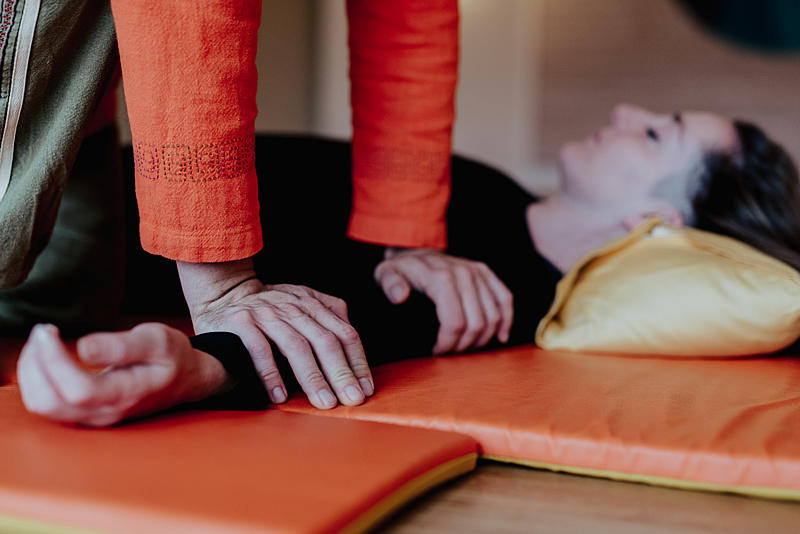 Compared to traditional Thai Massage, the pressing being used in Thai Yoga Massage is a softer form, where it is about 'sinking' into the body but not against its resistance. Therefore, this form of massage is experienced as very relaxing and the treated person is able to let go completely. Thai Yoga Massage helps with discomfort like back- and neckpain, headache, various muscle pains, fatigue, restlessness and stress. 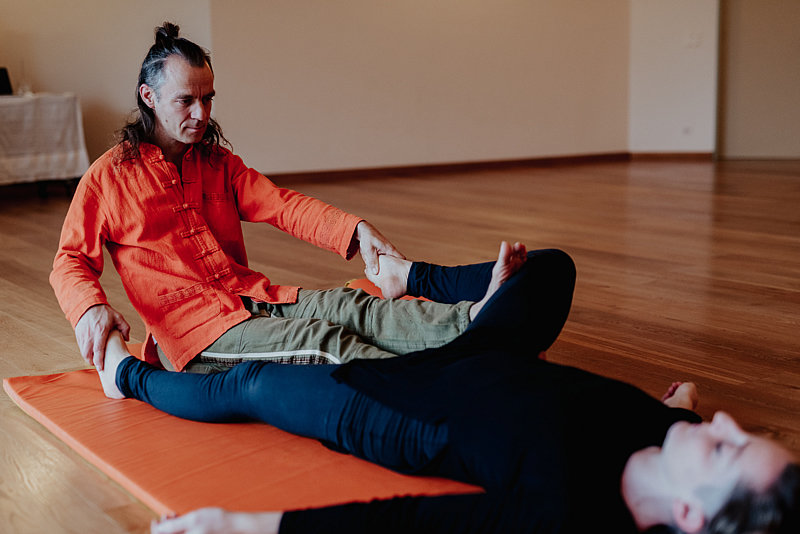 The treatment enhances the flexibility and elasticity of the body, helps to overcome malposition of the body, releases energy and opens a room of being one with heart, body and soul. 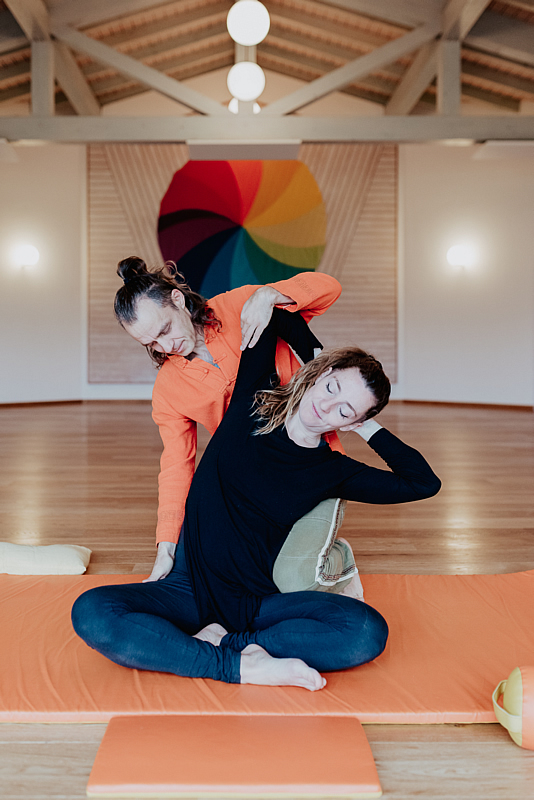 Especially when people are confronted with physical and emotional stress, are using a different form of therapy to master problems or have difficulties to relax, Thai Yoga Massage can create a secure and safe room for overcoming these blockades. For a longterm benefit, it is recommended to perform the massage in regular intervals. This helps giving the body and oneself enough calm and time for a lasting change. The roots of Thai Yoga Massage go back approximately 2.500 years to India, during the lifetime of the Buddha. Jivaka Kumar Bhacca is said to be the founder of the Thai Yoga Massage. He was a significant medical doctor of King Bimbisara and friend of the Buddha, in the kingdom of Magadha, known today as India. It is assumed, that the teachings of Jivaka Kumar Bhacca, together with the teachings of Buddhism, reached Thailand approximately 2.200 years ago, where they came into contact with the chinese concept of acupuncture and other traditional forms of massage and developed today's known form of Thai Yoga Massage.